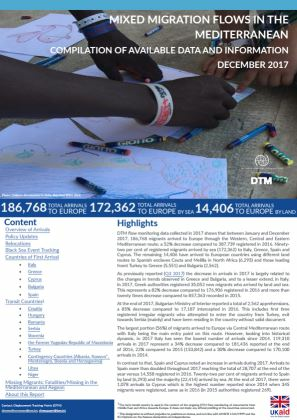 DTM flow monitoring data collected in 2017 shows that between January and December 2017, 186,768 migrants arrived to Europe through the Western, Central and Eastern Mediterranean route; a 52% decrease compared to 387,739 registered in 2016. 92% per cent of registered migrants arrived by sea (172,362) to Italy, Greece, Spain and Cyprus. The remaining 14,406 have arrived to European countries using different land routes to Spanish enclaves Ceuta and Melilla in North Africa (6,293) and those leading fromt Turkey to Greece (5,551) and Bulgaria (2,562). the decrease in arrivals in 2017 is largely related to the changes in trends observed in Greece and Bulgaria, and to a lesser extend, in Italy.